Christmas fruit cakes have been posted on many blogs, so I thought of doing something different and yet complement the Christmas flavour. 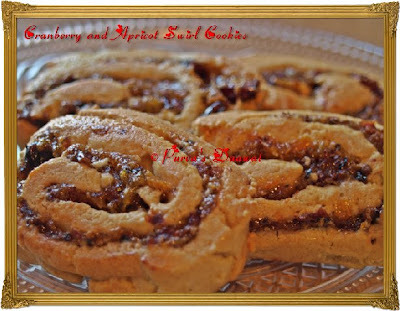 My swirl cookies or pinwheel cookies are inspired by the classic swiss rolls. They are filled with the fruity combination of cranberries and apricots, infused with the flavours and aromas of Christmas spices (cinnamon and cardamom). 1. Sift the flour, baking powder and salt together and keep aside. 2. Take cubed butter and sugar in a bowl, and with the help of an electric beater or hand blender whisk them together for almost 3 minutes or till the butter becomes very fluffy and double in size. 3. Now add the egg in the butter mixture and whisk it again for 5 minutes. The mixture will become very fluffy and will increase in the volume. Use hand blender for whisking it makes life easy. 4. 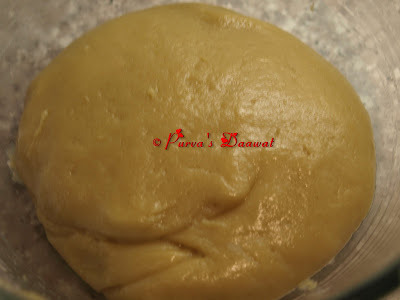 In a food processor pour the butter , egg mixture and flour, blend it till the flour turns in to a soft dough. You can knead the dough with your hands, but I prefer blending cookie dough in a food processor as it is less messy and you don't have to handle soggy dough in your hands. The dough will be soft and fluffy. 5. 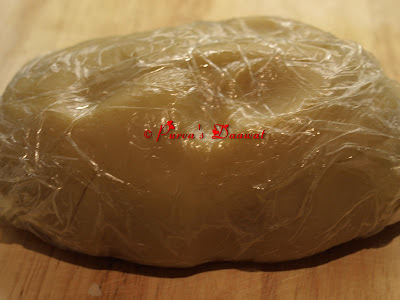 Wrap the cookie dough in a cling film and put in your deep freezer for 40 minutes to make the dough tough. 6. Meanwhile prepare a fruity filling. Soak raisins in a bowl of warm water for 20 minutes. 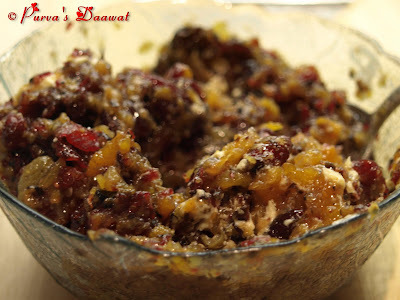 In a bowl, add Cranberries, Apricots, Soaked and drained Raisins, Orange Zest, Cinnamon Powder, Cardamom powder and Nutmeg Powder. Blend them together and form a Coarse paste. 7. Add honey and butter in this fruity filling and mix properly and keep it aside. 8. 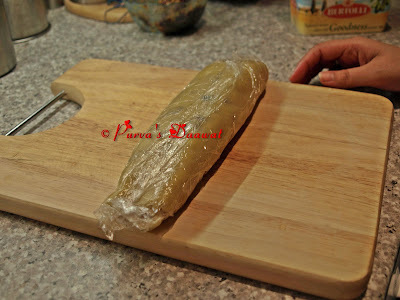 Remove the tough cookie dough from the freezer and place the dough in between two wax papers or oiled cling film and roll it in a long rectangular shape. 9. 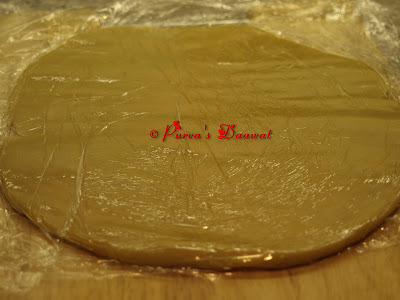 Remove the top wax paper / cling film and spread the fruity filling on the rolled cookie sheet evenly. 10. With the help of the wax paper below roll it up the cookie dough. 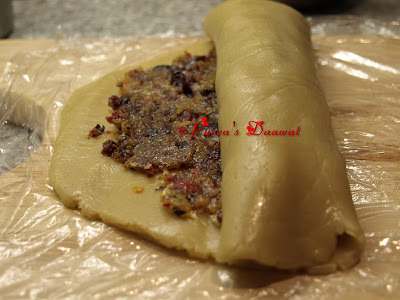 Once the dough is entirely rolled up, again cover it with a cling film and freeze it inside the freezer for 40 Minutes. 11. Preheat the oven on 180 degree Celcius. 12. Remove the roll from the freezer, unwrap it and cut the roll in to slices. These slices gives the swirl effects. 13. Place these cookies of the ungreased cookie sheets or baking paper and bake on 180 degree celcius for 8 - 10 minutes or till edges are firm and bottoms are lightly browned. 14. Once baked, remove them from the oven and allow the cookies to cool on a wire rack. 15. You can have this delicious cookies warm as well as cold and they can be stored in the air tight containers for a week. I have stored them in a cute Christmas Box. wow! drooling purva. step by step tutorials & the box awesome!Purva will we get cranberries in mumbai? where? Wishing u & ur family very happy & prosperous New Year! That looks festive and lovely! Nice stepwise instructions. I love the box filled with cookies... Happy New Year to you Purva! delicious cookies Purva! so mouth-watering! A very happy new year to you and your family too! Very Festive and Lovely. Love the step-by step pics.Love the box. Wow purva send me the box filled with cookies...lovely n simply fabulous..adding cranberry n apricot might have turned the cookies more festive..na!!! Wow its really looking yummy! Thanks for the detailing. Even I like the Box. Looks fantablous. Very nice step by step explanation. Nice clicks, can u send some as new year gift. Looks lovely and delicious. Happy New Year Purva ! Happy New Year to you and your family dear. Hey Purva, ur cookies look so yummy!! Thanks for step by step pictures and details. I always wanted to try swill roll type recipe... and ur recipe is perfect. Wow awesome, yummy and tempting pinwheels. Yummy cookies.....Wish you and your family A Happy & Prosperous New year. Wow, these pinwheels looks so cute an yum !! Happy New year !! Lovely cookies! gr8 baking again purva! Hope u had a blast for the new yr! Happy New year ...cookies looking so delicious..wonderful way to celebrate xmas ...aur kya haal hai.. 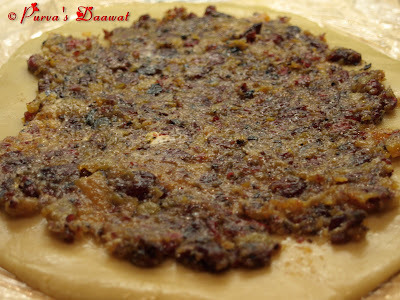 I am a regular visitor of your blog, and I have tried many dishes featured on your blog. But I never got a chance to comment on those dishes, which is unfair on my part. 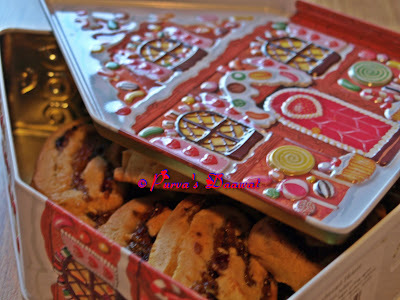 I simply loved the swirl cookies, they are packed with lovely fruits and spices. Thank you for your step by step picture instructions. Those are a beautiful creation Purva. & the fruits that went in are sooo good, all my fav. I have to try this out. Hi Purva, wish you a fabulous 2009! I have changed my blog title. Nice cookies...looks so yummy! Love the pinwheels and scrumptious cookies.